There are a number of situations where an industrial-strength, commercial dehumidifier is what you need. For example, if a house has become flooded due to storm conditions or a pipe bursting, you have to dry out the affected area--fast! The damage that the water can cause can be catastrophic if left untreated. There can be damage to curtains, walls, floors, and carpets, as well as mold and mildew that might start to spawn. It’s essential that the rate of dehumidification should exceed the rate at which the water evaporates into the air. That way, you have a chance of getting the water out of the affected room. 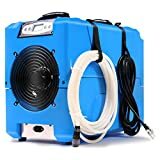 Alternatively, an industrial-strength dehumidifier may be essential if you have a greenhouse of plants that grow best in a controlled environment. A dehumidifier will take in the greenhouse’s air, and send it out at the desired temperature and relative humidity. This will ensure that plants that grow in precisely the environment that they need. It will also reduce the chance of humidity-related plant diseases, damaged yield, or the spawning of insects and other pests. That also reduces the need to apply pesticides--sparing you needless expense, as well as the health risks involved in using pesticides. The dehumidifiers that consumers usually buy are capable of maintaining humidity levels in the home. Most of them are condensing-type dehumidifiers. They use a refrigerant to chill metal fins, as in an air conditioner or refrigerator. A fan then draws humid air over the cold fins. When the moist air hits the fins, the water vapor in the air condenses on the fins and collects in a reservoir. Depending on the size of the room and the dehumidifying requirements, you’ll see units that can remove 30, 50, or even 70 pints of water per day. But there are commercial dehumidifiers that are capable of much more--some, such as the Maxxair, can remove 145 pints per day! And for greenhouse owners, there are special dehumidifiers, such as those made by DryGair, that can remove 95 pints of water per hour! Conventional Refrigerant Dehumidifier: These are also known as “Relative Low Grain Refrigerant” dehumidifiers. The name is referring to a measure of the water vapor molecules in the air, measured in grains per pound, or GPP (as we’ll see later on). The refrigerant is run through a coil, which cools it below the dew point. This causes water vapor in the air to condense on the coil, where it then collects in a reservoir. These conventional refrigerants will lower the humidity to the desired level of 40% relative humidity, and are adequate for everyday maintenance. Low Grain Refrigerant (LGR) Dehumidifier: These are capable of getting the grain per pound level below 34 GPP. This refrigerant will continue to remove water vapor even when the relative humidity goes below levels where a conventional dehumidifier will turn off. Super Low Grain Refrigerant (SLGR) Dehumidifier: These work by lowering the air temperature even lower, before it encounters the coil with the cold refrigerant. This removes even greater amounts of water vapor. The AlorAir Storm SLGR will remove as much as 160 pints of water per day, at 80 degrees and 60% relative humidity. For greenhouses: The Enviroboss EB140 80-Pint Commercial Dehumidifier is designed for greenhouses, to prevent accumulation of mildew and mold. It can remove up to 16 gallons of water per day--128 pints! For industrial-level cleaning and restoration: These are for situations where a home or basement has suffered flooding. Many of these are portable so that you can wheel them to an affected area. 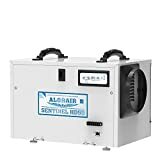 The AlorAir is an example of a compact dehumidifier that is adequate for dealing with flooded basements and crawl spaces. Display: If you’ll run your dehumidifier in a basement or garage, you’ll want a clear display, so that it’s easy to check the humidity and temperature settings, even in poor lighting. Set it and forget it: As opposed to dehumidifiers for the average consumer, commercial dehumidifiers need much less maintenance. The filter of a consumer dehumidifier should be cleaned once every two weeks. But the filter on the Aprilaire 1830 Dehumidifier doesn’t need to be cleaned more than once a year! 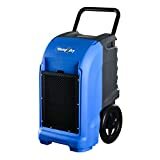 People are pleased with the fact that an industrial dehumidifier can hold up longer--people who used to replace their simple dehumidifier once a year can now run their industrial dehumidifier for five years straight without any servicing. Desired humidity levels: It’s advised to keep humidity below 60%, so as to prevent spawning of mold and mildew. Reducing humidity below 50% is adequate to prevent the proliferation of dust mites. Although you typically won’t want to lower the humidity more than 45%, you’ll see that commercial dehumidifiers will go well under 30%. This is to remedy an emergency situation, such as flooding due to heavy rains or a water main break. 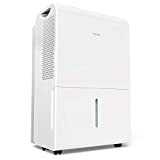 Get the dehumidifier according to the area of the room: You should consider the room size when purchasing a dehumidifier. 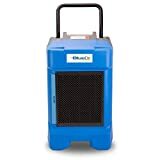 The Dri-Eaz F515 PHD 200 Compact Dehumidifier is suitable for rooms as big as 15,000 cubic feet! Equipped with pump: Since it will be removing substantial amounts of water from the air, you’ll surely want a commercial dehumidifier that is equipped with a pump. This way, you can be sure that the condensed water will be disposed of properly down the drain or sink, even against the direction of gravity. The Perfect Aire 1PACD150 Damp2Dry Commercial Dehumidifier has a 40-foot long hose to dispose of the condensation. Relative Humidity: This is the percentage of water vapor in the air, relative to the maximum amount of water vapor that the air can hold at the present temperature. That’s why you’ll see different performance levels of the same dehumidifier, depending on the temperature. 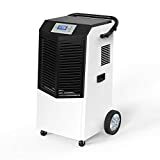 For example, the Mounto Commercial Compact Dehumidifier will remove 125 pints of water per day at 90 degrees Fahrenheit and 90% relative humidity, and 80 pints per day at 80 degrees Fahrenheit and 60% relative humidity. Dewpoint: This is the temperature at which the air is saturated with water vapor, to the extent that the water vapor starts to condense. For instance, you’ll see that water condenses on the outside of a glass of cold drink, especially on a hot day. The glass’ temperature has reached dewpoint. GPP: This stands for “grains per pound”. A water vapor level of 55 grains per pound is equal to 40% relative humidity. But low grain refrigerants will reduce the grains per pound even lower. They can get it down to 40 GPP--less than 30% humidity! The AlorAir Relative Low Grain Refrigerant can get the GPP down to 32! AHAM: This stands for “Association of Home Appliance Manufacturers”. They test air purifier’s ability to clean tobacco smoke, dust, and pollen from a room. PPD: This stands for “pints per day” that a dehumidifier is capable of removing. As we have said, 70 PPD is typical for a consumer model, while commercial models can remove 140 PPD. CADR: This stands for “Clean Air Delivery Rate”. This is a measure of the efficiency of an air purifier, considering room size and the volume of clean air produced per minute. Dri-Eaz makes industrial strength dehumidifiers, as well as devices that help you dry out your house after a flood or overflow of water. Their compact yet powerful appliances remove fumes, mold, and mildew from the air, as well as ventilate closed areas such as basements or garages. AlorAir makes dehumidifiers for both basement and crawlspace configurations, as well as for flood and water damage restoration situations. They also make air movers, air scrubbers, and high-pressure washers. 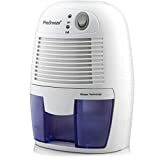 PerfectAire was founded in 2009, and are makers of room and mini-split air conditioners, dehumidifiers, humidifiers, microwaves, refrigerators and freezers, and more. 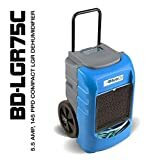 They make commercial and residential dehumidifiers, both with and without pumps, for a variety of room sizes. 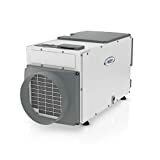 EnviroBoss make dehumidifiers for greenhouses and food processing environments that depend on serious humidity control to eliminate mold, mildew, and pests. They also make air movers that are intended to distribute air so as to evaporate excess moisture. 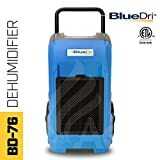 BlueDri, located in Irwindale, California, are makers of water damage restoration equipment and dehumidifiers since 2008. Their products include air movers, air scrubbers, and commercial-strength dehumidifiers.